The following photographs were found on Pacific Biodiversity Information Forum by Steve Higley and posted to the Jarvis Island Interest Group. He estimates the photographs are a few years old. The original captions have been left intact. 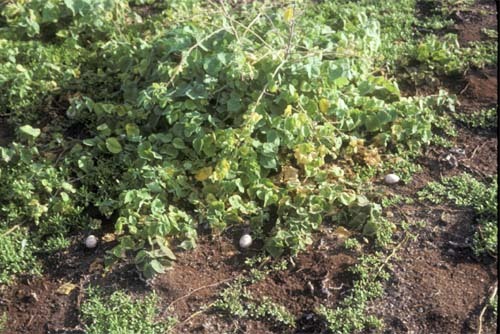 Sooty Tern (Sterna fuscata) eggs, first eggs laid for the season, sheltered under Abutilon (Abutilon sp. ), Jarvis Island. Main Masked Booby (Sula dactylatra) colony on Jarvis Island, US Line Islands. 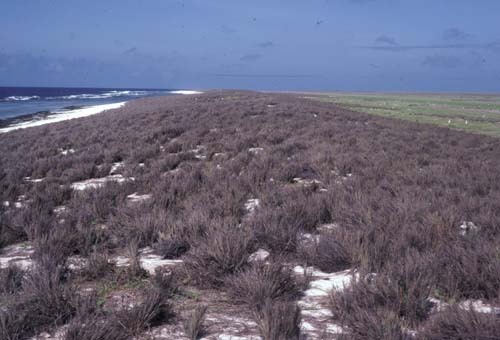 Grassy dune on Jarvis Island, U.S Wildlife Refuge administered from Honolulu, Hawaii. One of the dominant ground covers on Jarvis, a very dry equatorial island with no shrubs or trees. 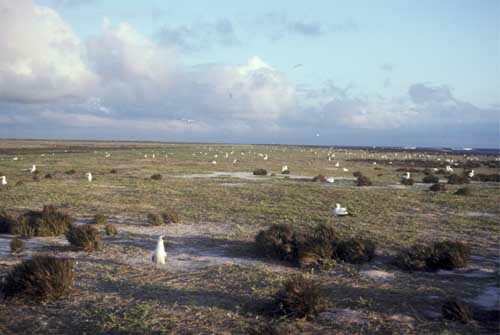 Masked Boobies on grassy dunes on the southeast coast of Jarvis Island. Up to 7,000 pairs of Masked Boobies have been counted, one of the highest counts in the world. The eradication of cats on Jarvis Island By the U.S. 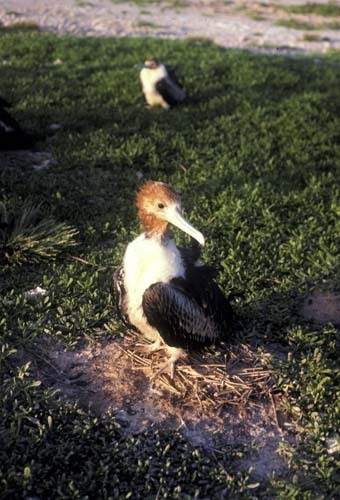 Fish & Wildlife Service in thee 1990s, was a major contribution to global seabird conservation. Large flock of Sooty Terns on beach on Jarvis Island. Sooty Terns love dry equatorial islands, where there is plenty of room to expand. They do particularly well when there are no mammalian predators. Jarvis' Sooty Tern population is now about one million pairs! One of the largest colonies in the world. 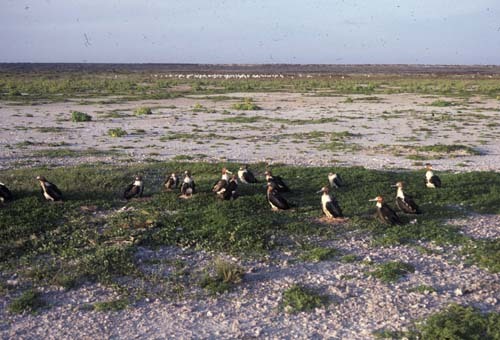 A colony of Lesser Frigate Birds (Fregata ariel) with a club of Masked Boobies (Sula dactylatra) in the background. 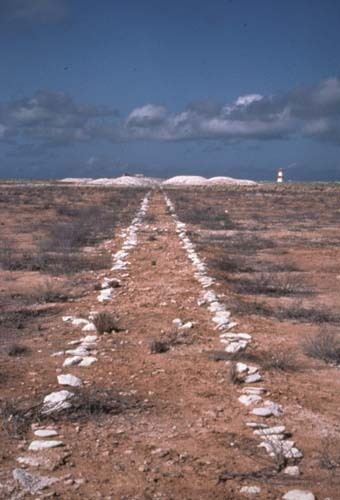 Remains of a guano tramway on Jarvis Island. Harking back to the late 1800s, when Jarvis guano (seabird excreta) was mined by the multiple tons and sent to the USA and Canada for growing what and corn. Guano from dry islands collected faster than that on wet islands, especially if the birds were ground nesters. 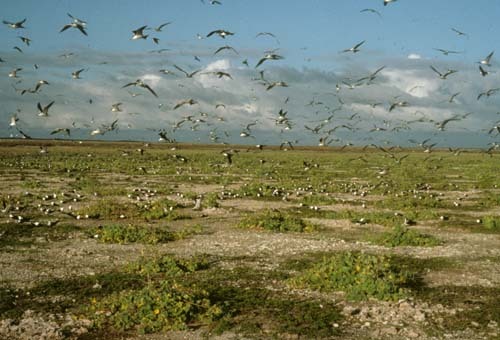 Thousands of generations of Sooty Terns contributed to this vast "goldmine" of nitrogenous fertilizer. U.S. 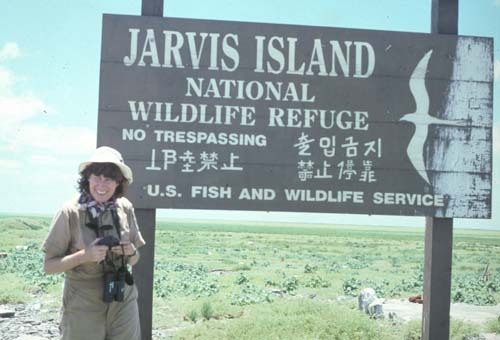 Fish and Wildlife personnel (Beth Flint) standing next to the Jarvis Island Wildlife Refuge sign. Dr. Beth Flint is not only the principal ornithologist and ecologist for the US Fish & Wildlife Service Remote Island Wildlife Refuges, based in Honolulu, but is the Pacific's seabird specialist. 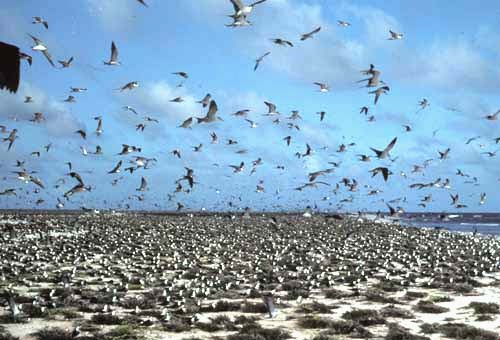 A colony of Lesser Frigate Birds on Jarvis Island. Jarvis Island is one of the world's most remarkable seabird islands. It is very dry, with exposed land area 1100 acres sparsely vegetated with grasses, vines and low shrubs. 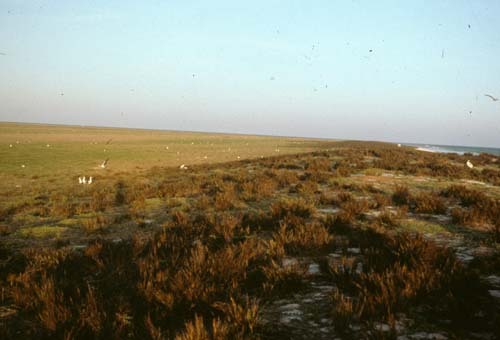 It was once heavily mined for guano (beginning 1858), but has now recovered, is FREE of CATS (a remarkable achievement of the US Fish & Wildlife Service) and is now a USFWS Wildlife Refuge. Lesser Frigatebird populations are up to 3000 pairs. 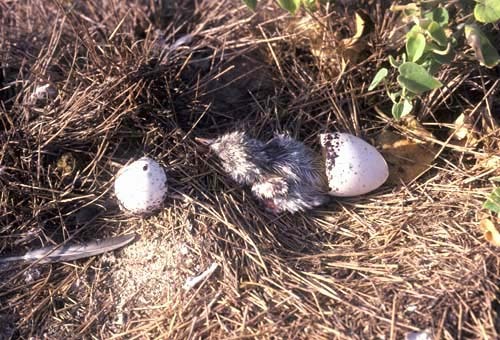 A recently hatched Sooty Tern (Sterna fuscata) chick, still wet and in the nest. Sooty Terns are the most abundant species here, counts ranging from 500,000 to 1,000,000 pairs of birds. Tiny chicks such as this are very vulnerable to cat predation, but fortunately there are now no feral cats on the entire island. A juvenile Lesser Frigate Bird (Fregata ariel) sitting on a Sesuvium mat on Jarvis Island. 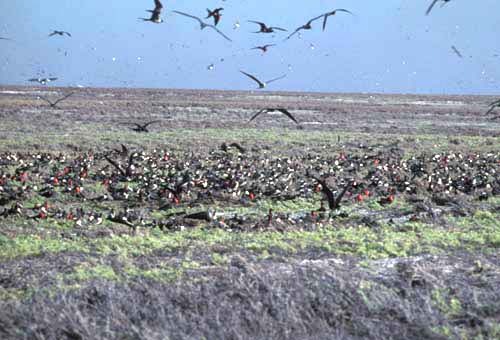 Lesser Frigatebirds nest in large numbers only on a few islands in the Pacific, all uninhabited. The largest number of pairs counted in the last 15 years was 3000 by Mark Rauzon. A colony of Sooty Terns (Sterna fuscata) on Jarvis Island. Sooty Terns are always ground-nesters, and were major contributors to the guano industry of the 1800s, because of their extraordinarily large numbers. Today up to 1 million pairs nest on Jarvis Island.